In this episode, the hunt for the stolen D-Tectors takes the kids through the streets of nostalgia for seasons we actually liked. 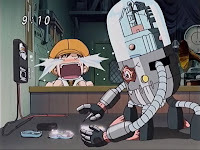 Even though the digidestined are morons for letting it happen and the specific episodes range between average and terrible, we should at least stop to appreciate the fact that this missing D-Tector thing is a proper connecting plot in this sequence. It would be so easy to pull the season one trick of having JP, Ranamon, Zoe and Tommy each finding their beast spirits between bouts of wandering aimlessly through the desert with no story bridging the gaps. The stupidity of the crisis makes it hard to give each episode any extra credit, but it helps that the gang goes into this Autumn Leaf Fair with a specific purpose in mind. Still, this episode is surprisingly decent, which is unexpected for something committing the dual crimes of lazy animation and focusing on Tommy. 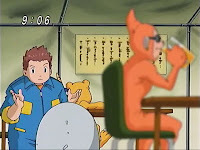 The lazy animation is apparent in portraying a vibrant lively marketplace through still frames of various NPC Digimon. They don't move, they don't talk, and they only rarely appear to be doing anything interesting. There's also a lot of Etemon sightings, which is a little unnerving. 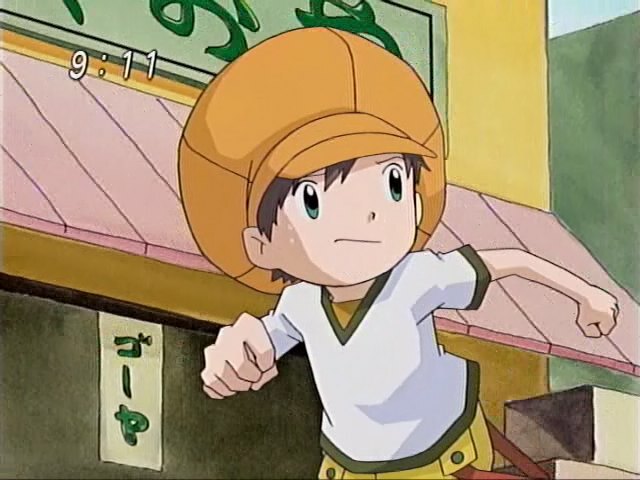 The good news is that the various NPC Digimon are frequently beloved favorites from the first three seasons. Some are even spotted in natural pairings, like Gotsumon & Pumpkinmon or Wizardmon & Gatomon. Look closely and you can also spot Agumon, Veemon, Wormmon, Terriermon, Armadillomon, Gomamon, Palmon, Tsunomon, Koromon, Impmon, Piximon, Demidevimon, Lillymon and Taomon. Gallantmon even gets a speaking line using the combined Guilmon/Takato voice, even going so far as to refer to himself as “we.” It's one of the cutest silly dub moments we'll encounter. There's also all sorts of poor logic going on here. Tommy's beast spirit is somehow contained inside a video game cartridge that can only be released upon beating it. Datamon, who despite his entrepreneurial moxie seems to be a fair guy, refuses to share the spoils with the kid who helped him acquire them. Rather than getting support from his friends, Tommy tries to find something to trade for the D-Tectors by running the hell out of town. There's enough here to make the episode completely dismissible, and yet it still kinda works. There's just something very admirable about the way Tommy handles this one on his own. He doesn't have to, and probably shouldn't, but he has it in his head that he's going to be the one responsible for getting everybody's D-Tectors back. The journey is very bumpy, his kindness appears to go unrewarded twice and he bursts into tears several times. But damned if he doesn't manage to get those D-Tectors back. Even when it is due to the hokey act of Datamon seeing Tommy's good deed through the camera box, it still counts. You just have to nod your head and give the boy some props for this one. After all, Takuya and Koji weren't making any progress and JP and Zoe spent the whole episode eating. Part of the appeal is that Tommy is aware of his inferiority. 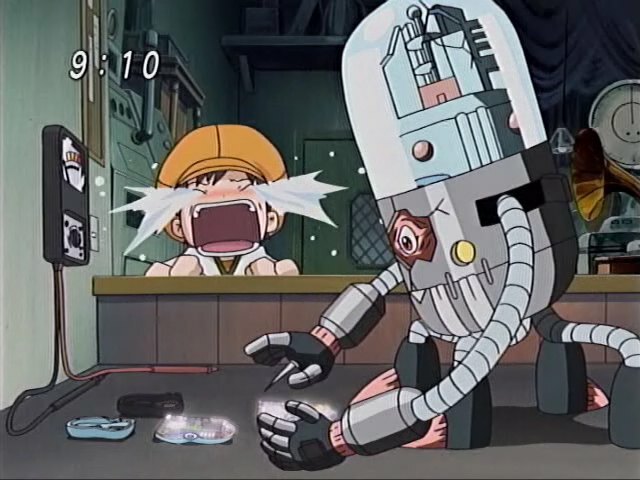 When Datamon starts tinkering with his D-Tectors, Tommy's more concerned about preserving the other three, seeing as they're the ones that will be doing the bulk of the world saving. A show that knows what it's doing would prove him wrong and make him a crucial component, but Frontier doesn't and Tommy already seems to recognize that Takuya and Koji will be doing the heavy lifting. But rather than mope about this fate, he strives to contribute whatever little he can wherever he can. He sees this as a chance to come through for his friends, and he steps up to the challenge. As an added bonus, his beast evolution is actually respectable and dominates Petaldramon, making Zoe's performance last time look even worse by comparison. I'm not going to try figuring out the geography that takes them from tropical island to rampaging river to glacier in a matter of minutes. I will try to figure out the odd bit of random shipping fuel inherent in Koji lending Zoe his jacket. Namely whether he did it because he's actually a nice guy, or just to shut her up. Seriously, if you go back and watch this to catch all the cameos, be warned: Etemon's in like every scene. If anyone has a D-Tector toy, I want you to take it apart right now and tell me if it glows like that. Because damn that's pretty. I'd comment on the unlikelihood that Zoe could actually down 30 plates of Autumn Leaf Fair cuisine, but anyone who's seen an episode of Slayers knows that scrawny girls can pack in meals like nothing. There's so many reasons to hate the name Korikakumon that it's not even funny. To think that the dubbers were probably hesitant to use a name as crazy foreign as Ikkakumon in the first season, then in season four switched the perfectly sensible Blizzarmon to make it more of an exotic throwback. They do a nice job allowing Korikakumon to have some control problems without letting it dominate the story. He's a little excitable, to the point where he shuts down in an effort to avoid calamity, but for the most part Tommy holds it together well. Hey, nothing wrong with Etemon sightings. Etemon rocks! "They do a nice job allowing Korikakumon to have some control problems without letting it dominate the story. He's a little excitable, to the point where he shuts down in an effort to avoid calamity, but for the most part Tommy holds it together well." In KorIkkakumon's official profile, it's mentioned that he prays to the god of ice and snow at the coming of battle. I think that's what he's doing here. Not that they bother to explain that, of course. The Etemon sightings were indeed jarring. So many of them! I also did enjoy the fact that Gatomon and Wizardmon are together again! It warms my heart! What I liked the most (despite my momentary wtf) was Gallantmon...and the Takato/Guilmon voice. Takato is back in the digital world, everyone! 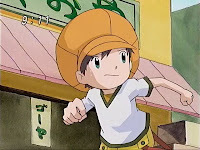 And, as he promised at the end of last season, he's playing with Guilmon! The thing I found most interesting about this episode is the fact that while the eating contest required it's participants to consume 30 plates worth of food, Zoe is seen with MORE THAN 45 empty plates. I always found that funny once I noticed it. Did y'all notice Vamdemon & Archenmon Camio ?